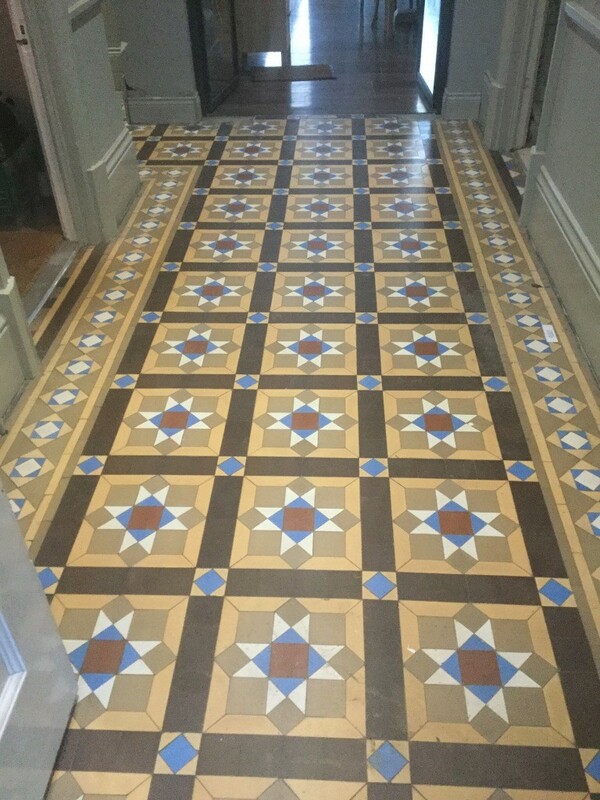 A homeowner in the Leighton Buzzard was having some renovation work done to their property and during the course of the work discovered an original Victorian tiled floor underneath the hallway carpet. The town dates all the way back to the 12th century so period features like this are quite common. Keen to have the floor restored the owner got in touch to ask if I could survey the floor and quote for restoring it, so my colleague Phillip popped round to see what needed to be done. Surprisingly the tiles were generally in quite good condition for their age with just a few cracks and chips here and there. 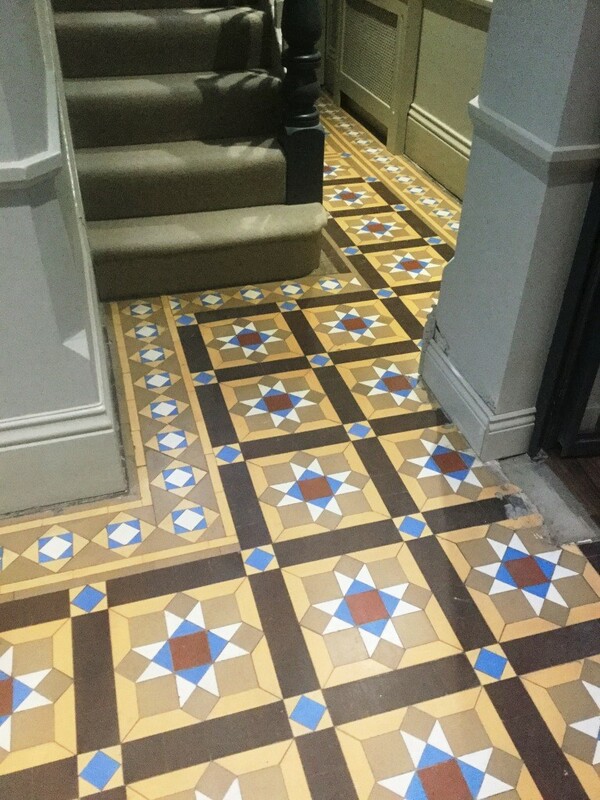 There were some missing tiles that needed replacing but I was able to help them source replacements which were fitted before the cleaning work commenced. I started the cleaning process by giving the tiles a deep machine clean with Pro-Clean which is a strong tile and grout cleaning product produced by Tile Doctor. A strong dilution was left to soak into the tiles before scrubbed in with a tile brush fitted to a rotary machine. This action lifted the surface soil and bits of plaster and paint which was then rinsed off and extracted using a wet vacuum. With the soil and cleaning solution removed I then carried out a full inspection of the tiles in their natural state to see what other work would be required. As there was no apparent sealer present, I decided that the next step in the cleaning process would be to use a coarse 200 grit burnishing pad to clean and resurface the tiles, this was followed by a second rinse and wet vacuum. I then went around on hands and knees using Tile Doctor 100 grit diamond hand blocks to remove stubborn staining around the edges close to the newly painted skirting boards. The floor was allowed to fully dry for 2 days before I returned to apply Tile Doctor Colour Grow sealant which is an impregnating sealer that improves colour and is fully breathable, so it allows any damp from the sub floor to dissipate. 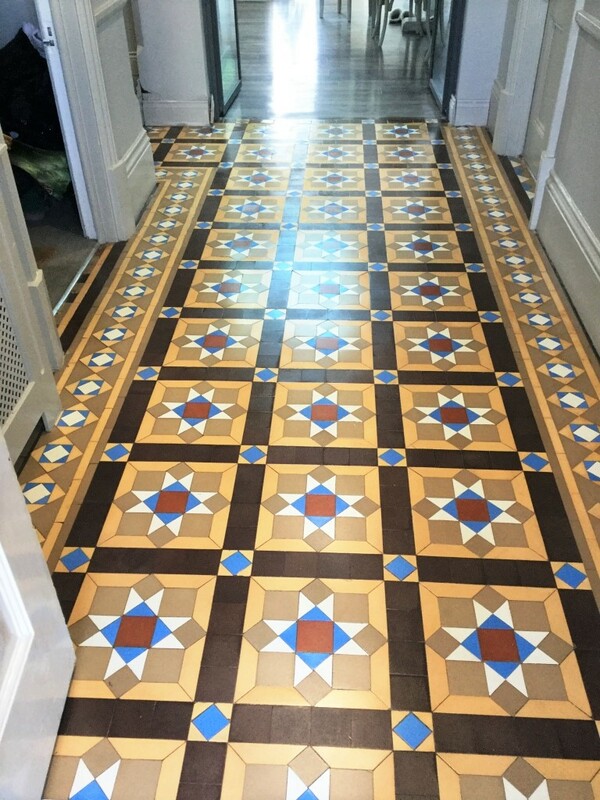 Choosing a breathable sealer is important for these old floors which have no damp proof course and Colour Grow is normally my sealer of choice for Victorian floor tiles. However Colour Grow dries to a matt finish and on this occasion the customer felt the finish still looked quite dull, although she was very happy with the results of the cleaning she asked if there was anything else I could do to brighten the finish, it was agreed that I would return a week later to carry out a damp test and if the results of this were favourable I would go ahead and apply several coats and apply Tile Doctor Seal & Go topical sealant which is water based and dries to a silk finish. When I returned moisture, readings were taken which were acceptable, so as agreed I applied several coats of Seal and Go to give the tiles the desired appearance. With the work completed the customer was happy with the final results and even left the following feedback via the Tile Doctor feedback system. 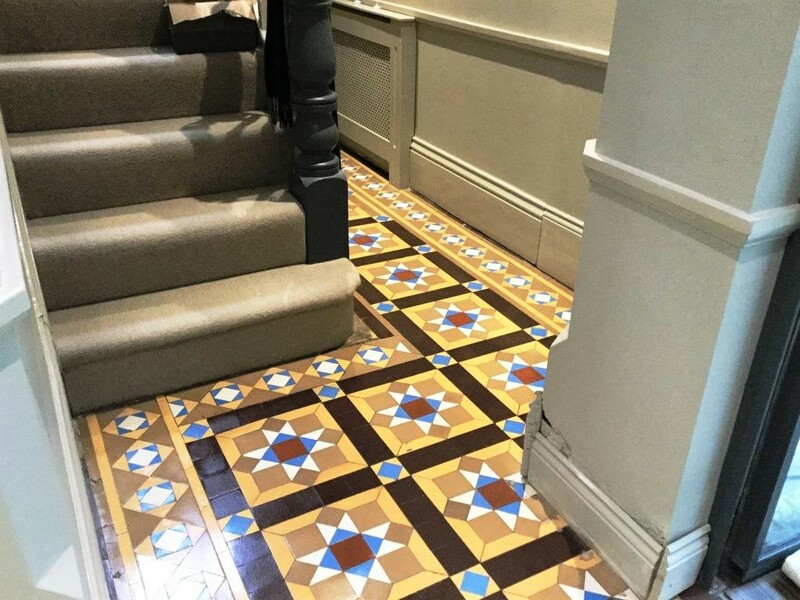 This entry was posted in Victorian Posts and tagged Floor, hallway, Leighton Buzzard, The Embankment, Tiled, victorian by AbzDominise. Bookmark the permalink.